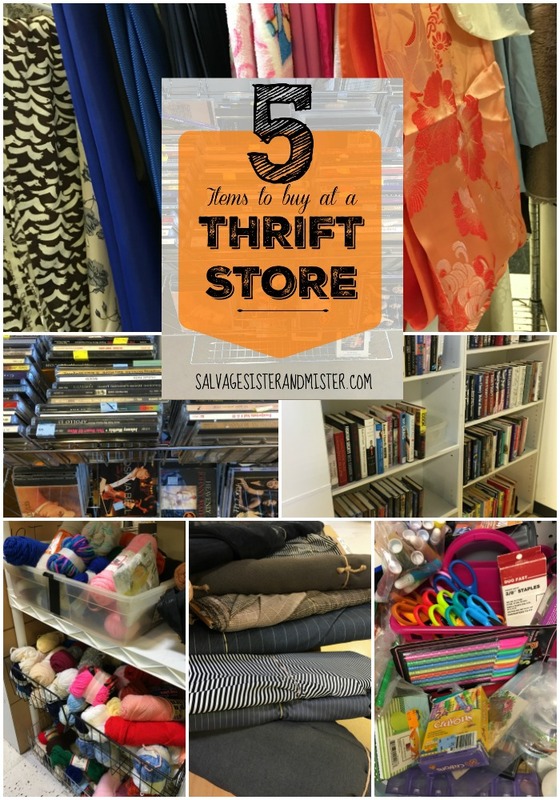 We are going to be up front and honest…..we think there are TONS of things to buy at a thrift store! Some things are obvious finds, clothes, books, etc, and some are not – maybe- so obvious. Today we are hoping to shed some light on the overlooked items. There is a little voice in the back of our head that says “What if you share this and everyone starts going to thrift stores and no good stuff remains?” Yes, that is a risk we are willing to take….because we care about you! But please leave some stuff for us, k? You here stories of people finding something really valuable at a thrift store….like a million dollar painting. Yeah, you probably aren’t going to find expensive jewelry but the inexpensive kind is plentiful and some really pretty stuff. Bonus- If you go to Disneyland (World), the team members have to trade pins with you. Look for pins donated at your local thrift store. If you are familiar with the pins, it will be fairly easy to see a real vs fake one. Now you have some to trade when you go there. Books are a given, but magazines, records, and video games are there too. You know how you download a $2 song with no problem? Well, CD’s are plentiful at most thrift stores. You can get the whole album often for what you paid for one song….awesome right? Another item that is cheap and cheerful……DVD’s. With live streaming, people are dumping these things like crazy. Often you can pick them up for $1 or $2. That is about the same price at downloading it for a one time use. Finally, antique books for décor, crafts, or collecting is another good find. If you are a crafter, you will understand this. We are often optimistic about the amount of craft projects (and supplies) we can handle. The result, after we come to terms with the fact that we can’t so them all, we donate the supplies to become more organized. Our over zealousness is your benefit. Bonus – Fabric not only is a great price but often plentiful there. Oh this secret is a hard one to give up……. Vintage napkins and linens are a great find if that’s your jam. They are often very reasonable because all napkins are priced the same..not based on it’s age. Please don’t take them all!!!! We can’t tell you how many times we have purchase entire reams of new notebook paper. When back to school shopping happens, people must go crazy and then donate all their leftovers. Whatever the case is, this is a great place to scour for the mid year supplies when they are no longer dirt cheap. Plus, maybe items you could donate to a school in need. Look for binders, pencil pouches/boxes, packs of writing tools (pens, pencils, markers), scissors (ask to try first) crayons, envelopes, etc. Even packs of greeting cards/thank you notes can be a great find. 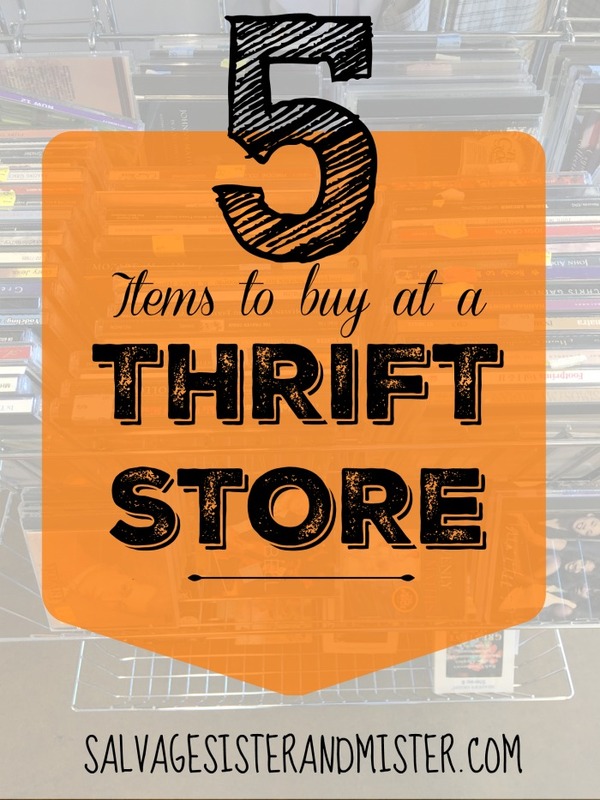 Your local thrift store is a great resource. Hopefully you found some additional items to look for when you are out junkin. AND please save some for us. YES!!! These are all great! I need to get out to more thrift stores. Sometimes I wished we lived in a little bigger city because usually if I’m driving into the city it’s for other things and no time to really “thrift”. 🙁 I need to hit some up because I’m trying to find some good hiking shoes/sandals without having to spend full price. Kirstin, I bet you could find some but it does take time for sure. I love thrifted things. It is the Thrill of the Hunt and it makes my Heart sing with Joy when I find something that I love. Basically I love everything Vintage! Vintage Jewelry, Vintage Linens, Vintage Furniture, Etc. I have in my possession the Sheets that my Grandmother made in Italy when she and my Grandfather got engaged back in the early 1900’s. I consider it an honor to have them. They came over to the United States as NewlyWeds with $50.00 in their pockets. My Grandfather was a Custom Tailor. And he worked his way up to become a partner in a Custom Tailor Shop. Later he became the sole Owner of that same shop. When he passed away his shop was left to my Uncle who in his own right was a Custom Tailor. He made Custom Suits for some of the New York Giants. He could make a suit without a Pattern. Peggie, i am a huge vintage lover too because of the that kind of craftsmanship you are speaking of. Incredible!! Thanks for your comment! Wow, thank you so much for this post. I got to keep my eye out for a few of these wonderful things. Ivory, Thanks for stopping by! Hopefully you received the newsletter.